If you have been following me for a while, then you may have noticed that I have a love/hate relationship with my kitchen. Some days I don't mind it, other days I wish I could just tear it all down and start over! Do I want white cabinets to make the current granite counter tops work in the space? Or do I want to keep the current cabinets and hope (fingers crossed!) that we are able to update the counter tops and back splash in a couple of years? I just can't make up my mind! 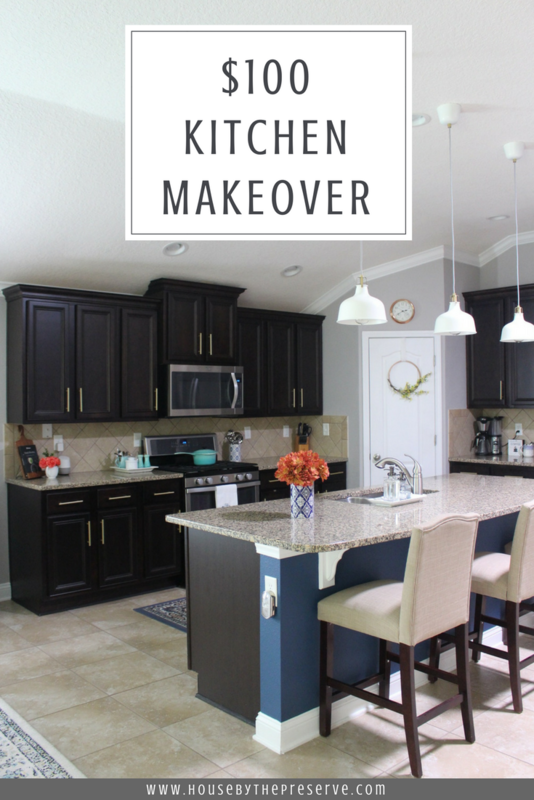 So while I let these questions run around in my mind, I decided to give the kitchen an affordable makeover in hopes that it will keep my desires of tearing it all down at bay. First, I started with a kitchen island. I painted the lower half of the wall with leftover paint I had from my closet office. A beautiful deep blue called "Infinite Deep Sea" by Behr Marquee. The previous color was similar but with more gray tones while this blue is more vibrant and looks stunning against our counter height chairs from Target. We also updated the lighting right above the island. These pendant lights are from IKEA and a total steal for $24.99 each. I wanted to bring in white to help brighten up the space against the very dark cabinets and I love the touch of gold that they bring. In order to carry the gold over to the cabinets, we decided to paint our current hardware a gold. The process was fairly painless and I love how something as simple as paint can change the look of the kitchen so much. I simply took off all of the hardware and soaked them in a 50/50 vinegar water mixture for about an hour. Rinsed and let them fully dry before I took them outside to spray paint a beautiful gold tone. The pantry door also got a little update. I'm dying to lighten this space up by changing up the backsplash and the counter tops but that isn't in the budget just yet. So I decided to paint the pantry door all white as I felt the chalkboard inserts I had painted a couple of years ago wasn't helping in lightening the space. Added a couple of accessories by shopping my home and there you have it! 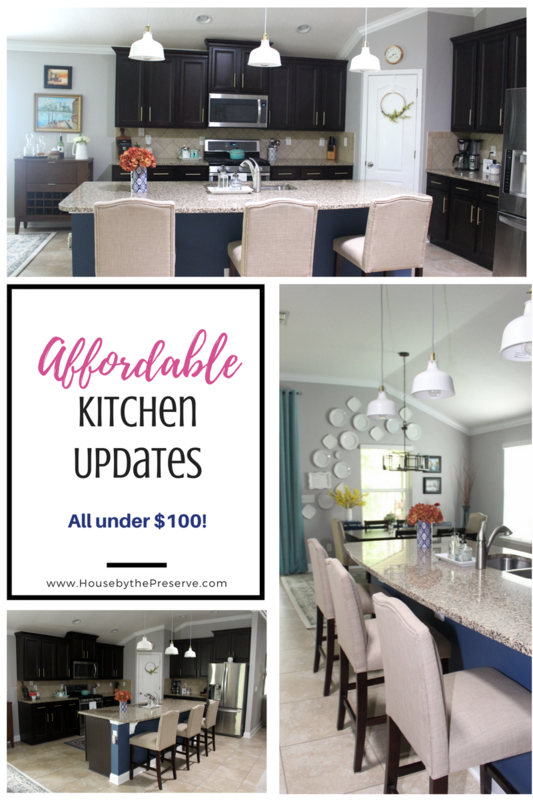 A simple, $100 kitchen makeover just in time for spring! 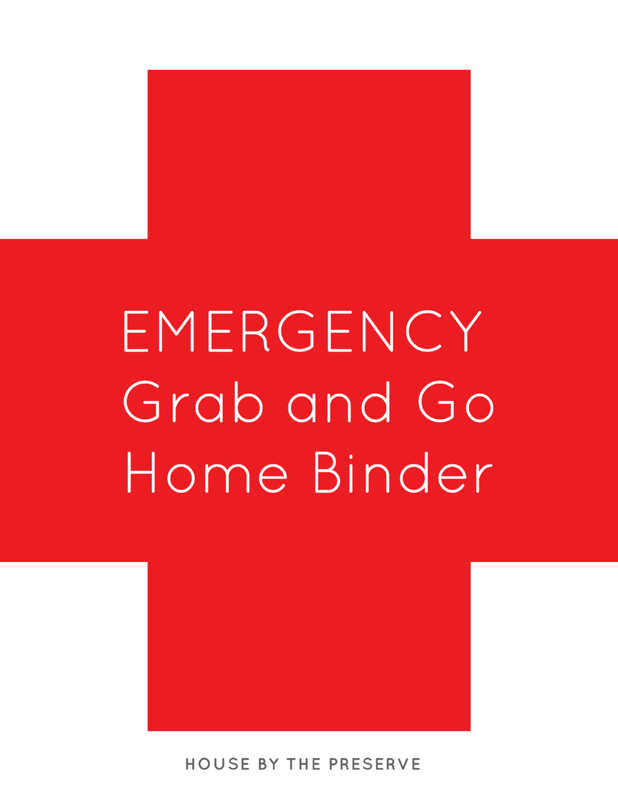 I hope this post encourages you to make your space work for you.